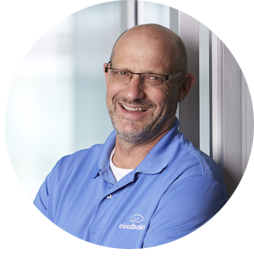 As a former CIO, and founder of Cloudbakers, I’ve been doing IT solutions for 35 years and cloud solutions for 7. That’s a long time. 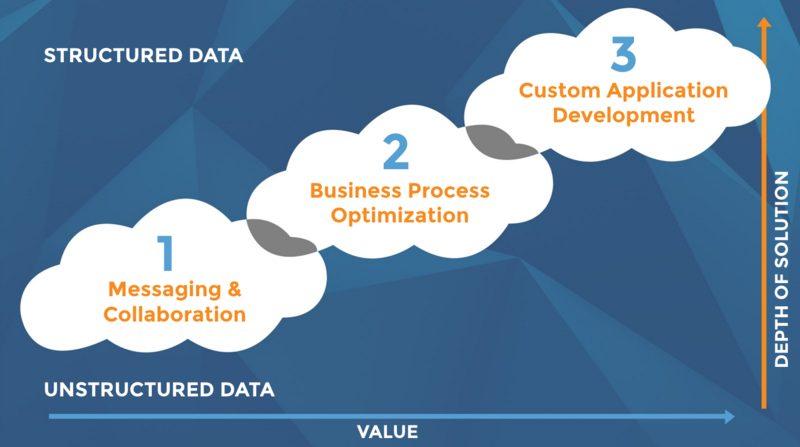 Over the years I have realized there is a successful pattern for migrating companies to the cloud; in the end it comes down to a 3 step process. First, move over commodity applications, generally your messaging and collaboration applications. For many this means treating their unstructured data with the same respect/reverence as their structured data; there is a lot of intellectual property in emails, documents, and chats worth tracking, managing, and securing. The next step is to further leverage the cloud with business process tools, building off the messaging and collaboration platform itself. One example is on the sales side, where companies attain a seamless call-to-close sales process that greatly augments efficiency. Finally, the unique characteristics of the company are examined and used to fuel custom application integration and development. No two companies are the same, nor their solutions. This last step is where the magic happens, tailoring specific solutions to a business’s exact needs and in the process creating and maintaining a competitive edge. We’ve seen many clients form new business models and then be able to monetize these new data streams. The first step any company has to take is to decide which platform they want as the foundation for their cloud solutions going forward. Obviously there are a number of options out there, but the two big players are Google and Microsoft; offering G Suite and Office 365, respectively. While both of these are powerful, game-changing platforms, it's important to note that they have certain differences that can make each more or less optimal for a specific company. Your selection between the two should be made via a lightweight company analysis done by a Cloud Service Broker (CSB) to make sure you get the right product. Whichever you end up with, the actual migration of your commodity applications is largely similar; email, calendar, documents, contacts, and phone are all taken from their on-premise and/or hosted servers and moved to a unified collaboration platform. For many companies, this is the first time they’ve synchronized all these services in one place. Quickly the benefits of a unified platform become clear. Companies experience end-to-end collaboration, live-editing files across teams. Communication evolves from emails, to chats, to video conferences. Revolutionary phone systems are incorporated, integrating seamlessly into the foundation platforms and exemplifying true Device Agnosticism/BYOD that all companies are striving to achieve. The list goes on. At this point it’s time to consider moving over non-commodity applications, and truly developing business process. When examining a company’s sales process, it's not rare to find holes throughout their workflow. These can lie between initial lead gathering and handing off to sales, between sales closing and operations, between CRM systems to financial systems, etc. Commonly these issues arise from inconsistencies in information logging. No company is perfect, and for SMBs still developing their business process, it is only natural to have hiccups along the way. The beauty of a cloud based model, however, is that these holes can be easily filled in, again building off the foundational platform. Cloud based CRMs (Zoho, MSCRMOL, SFDC) completely remove the issue of inconsistent information. From the moment you initiate a lead through their lifetime as a customer the information you log is edited in real-time and easily shared across teams and departments. Cloud management & analytics software is an easy next step (BetterCloud), as are tools for finances, reports, conferences, project management, project billing, you name it. But what if a company wants to add in something that doesn't exist (yet)? Once companies have a strong foundation platform in place, and have built upon it substantially, they tend to wonder where the real limits of these systems lie. And they look to developers for the answer. Fortunately, the IT industry has only just begun to scratch the surface of cloud based systems. We are in a stage where, for all intents and purposes, anything is possible. Whatever you can come up with, it can most likely be done. The cloud allows for complete tailoring of your platform to the specific style and needs of your business. Custom application development and integrations are what truly maximize the potential of a company migrating to the cloud. These can be partner portals, field service support, (managing trucks, inventories, repair records, etc. ), custom quoting, product add-ons, mobile worker tools, and so on. And as the depth of a solution increases, so does the value it adds to your business. On top of this, with all of the data you will now have readily available, monetization of this information is an easy next step; many clients and partners are interested in this feedback. Moving from on-premise servers to the cloud can be a big change, and is often met with hesitancy. This is understandable, as cloud computing represents a huge paradigm shift in business models worldwide. Still, this shift is well-founded, and Change Management is the answer to organization-wide transitions like these. Collaboration has taken on a new meaning. Efficiency is saving time and money like never before. Companies are advancing at an exponential rate, and waking up to a new operational style. Don't get left behind. Reach out to a Cloud Service Broker and see what we can do for your business. Want to see the Cloudbakers process in action? Check out Aspire Indiana's case study below.